Rolling Stones guitarist Keith Richards, famous for surviving years of rock ‘n’ roll excess, will release a children’s picture book with illustrations by his daughter Theodora Richards, his publisher said on Tuesday. The book, “Gus & Me: The Story of My Granddad and My First Guitar,” tells the story of how Richards was first introduced to music by his grandfather and given his first guitar. 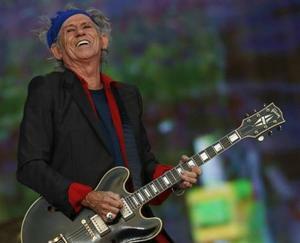 The hardcover and ebook will be released on September 9.
via On heels of memoir, Keith Richards to publish children’s book – Yahoo News.